There are few European cities associated with imperial style like Vienna, where hundreds of palaces, gilded monuments and museums attest to a grand past. Today, visitors to the capital of the Austro-Hungarian Empire can experience that lavish lifestyle for themselves. Relive the life of a Hapsburg empress at the delectable Schönbrunn Grand Suite at Schloss Schönbrunn, a UNESCO World Heritage site that is fully restored and preserved by the state. Emperor Leopold I, a big fan of Versailles, commissioned a top Baroque architect to build the 1,441-room Schönbrunn hunting lodge in the late 17th century. It was so popular that Empress Maria Theresia made it the imperial summer residence a half-century later. Thanks to the dedicated restoration in 2014 by Austria Trend Hotels, a private fifth floor apartment in the east wing is available to rent. This ideal family retreat consists of two regal bedrooms, two marble bathrooms with soaking tubs favored by the later Empress Sisi, an elegant fully-stocked kitchen, dining and living rooms, plus enough paneled corridors to wear out the kids. This apartment was once the home of Archduchess Elisabeth Marie of Austria. Granddaughter of Emperor Franz Josef, she was later known as the Red Archduchess because of her Socialist Party ties and activism on behalf of women and children. The suite exudes a contagious nobility. The elegant décor incorporates the black and white marble flooring, chandeliers and gilded stucco the Hapsburgs loved. The white furniture upholstered in red silk damask with a pineapple pattern is a replica of what’s seen on the must-do Schönbrunn Palace tour. Check-in at the Hapsburg’s “next door” guest lodge, the Austria Trend Park Hotel Schönbrunn (more on that later), whose gracious staff will happily carry luggage up the 88 worn limestone steps. After an orientation, enjoy the view over 45,000 acres, especially of the Gloriette, a stunning marble monument that was built to enhance the view. Families can visit the palace’s children’s museum, stroll the gardens and 32 outdoor sculptures, and tour Europe’s oldest zoo, the Tiergarten. An unexpected thrill is opening the hidden apartment door with a golden key, as curious tourists pull out their cameras. For an extra fee, stock the wine cooler with fine Austrian vintages and arrange for a chef to prepare supper and breakfast. Or, stick to the budget and the hotel’s staff will deliver all the fixings of a gourmet brunch plus fresh pastries before you awake. At night, a few continental cafes within palace grounds remain open so you won’t be caught microwaving a pizza. Schloss Schönbrunn Grand Suite (+43 1 87804) is located at Schönbrunner Schloßstraße 47, 1130 Wien, Austria. Rates for the two-bedroom suite including breakfast begin at €499 per night. 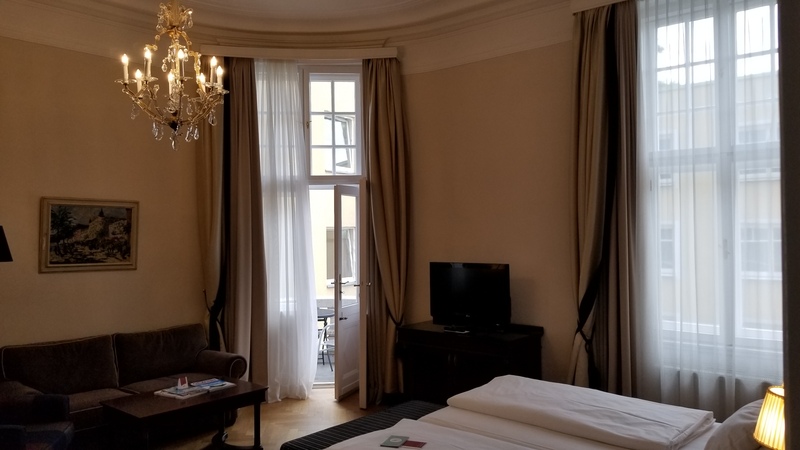 Suite at Austria Trend Parkhotel Schonbrunn. Austria Trend Parkhotel Schönbrunn also has a noble past, and at 40% less. 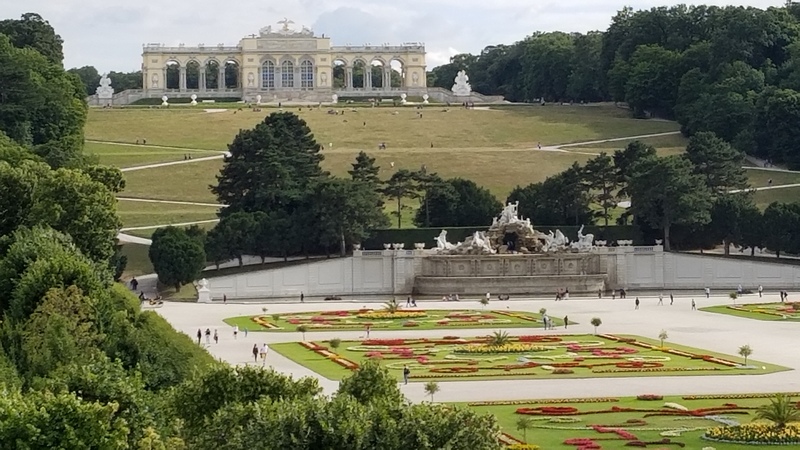 Built on the site of a small inn overlooking Schönbrunn, it became a fashionable casino in the 1800s where Johann Strauss senior and junior premiered several waltzes. After closing in 1907, Emperor Franz Joseph I built the luxurious Parkhotel for guests who included Thomas Edison and movie stars. In a yearlong refurbishment, Austria Trend Hotels added modern amenities and environmental efficiency to the classically decorated hotel. We admire the spacious (palatial at 40 square meters) executive rooms in the main wing, whose floor to ceiling French doors open onto Juliette balconies overlooking the neighborhood. Families can choose doubles with a couch that sleeps a younger child (ages 2-12 stay free), or book a series of adjoining rooms and revel in the chandeliers, hand-crafted armoires and marble parquet floors that the Hapsburgs loved. In addition, the hotel has a stylish bar, restaurant and a playroom for children. The imperial breakfast buffet is extra. The Austria Trend Parkhotel Schönbrunn (+43 1 87804) is located at Hietzinger Hauptstr. 10-14, 1130 Wien, Austria. Rates for a double room begin at €294 per night. Prince Gardens seen from the Schonbrunn Suite; photo c. Ron Bozman, RKR Media. If you can’t get enough of this lifestyle, there are three other main sites dating from the Hapsburg family’s reign between the 17th and 19th centuries. Hofburg Imperial Palace, the largest in the city, is now the residence and office of Austria’s president. Tour three museums inside: the Imperial Apartments furnished in the Hapsburg style; the Sisi Museum about the cult favorite Empress Elizabeth; and the Silver Collection of treasures from past royal families. The 18th-century Schloss Belvedere belonged to Prince Eugene of Savoy, and is beloved for two Baroque palaces, the Stables and the Orangery which houses Europe’s largest Gustav Klimt art collection. The ornate gardens in between are especially popular during the winter season when a Christmas market is held on the grounds. Lastly, follow the Hapsburgs to their deaths at the Imperial Crypt, Kaisergruft, which holds 145 sets of bones, including the remains of 12 emperors and 18 empresses. Built in 1633, it has been climate-controlled to protect them. And if you really Love Baroque or Neo-classical architecture? 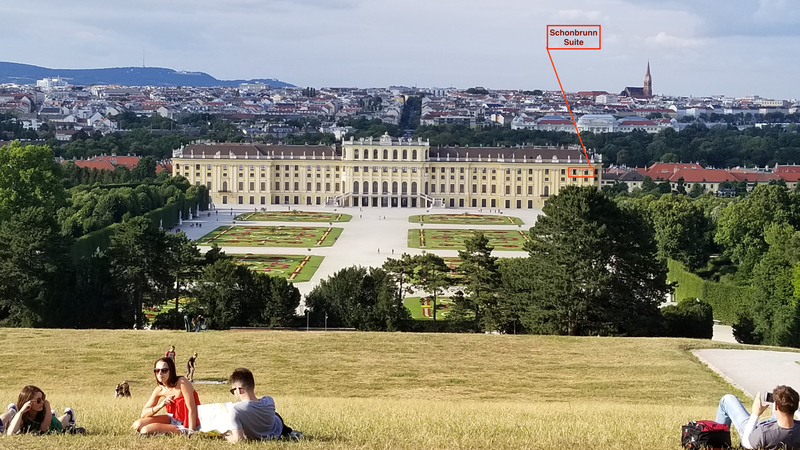 After seeing these, visit some of the more than 135 palais, smaller palatial residences of the local nobility, that Vienna Tourism can guide you to.